When I started pursuing minimalism a few years ago, I had some ideas of what I thought it would do to my life. Minimalism was going to help me keep my home cleaner, save me money, let me have time to do all the other things I wanted to do... I had it all planned out. I knew exactly what my life as a minimalist was going to look like. Or, I thought I did. Nothing ever turns out quite the way we think it will. But don't get me wrong! Minimalism did (and does) help me keep my home cleaning, and I spend a lot less, and I have a lot more time for other things. Like coffee. I drink so much more coffee now. And it's amazing. 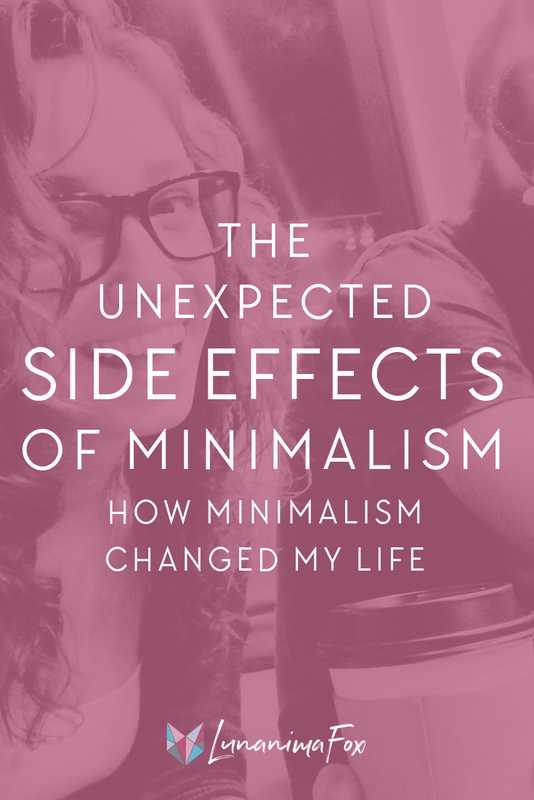 But even though many of my assumptions about minimalism turned out to be true, there were a lot of unexpected changes that happened in my life. I have a better appreciation of white space and silence. When I first moved into my house, the thought of any space being empty really bothered me. If there was empty wall space, I filled it. Unused room on a bookshelf? I'd get something to put there. Anything. Really, anything. My decorating skills were questionable at best. Any available space needed to have something in it. I fully believe that a full house was a cozy house, right? Cramped = cozy? Since I've adopted minimalism, having blank space in the house is something that I find soothing. I seek it out. I have a desire to create more white space. I can't get enough of it. Which is exactly the opposite of how I used to be. Another thing that bothered me before I found minimalism was silence. I always had to have music playing, or the tv on in the background. There had to be noise or I was uncomfortable. But why? Constant distraction from my thoughts? Probably. The mind of an introvert isn't always the easiest place to live. Unfortunately, my "noise habit" was something that I now know was contributing to my stress level. I am an introvert. And even though I knew that then, I didn't know how important silence was to my mental and emotional well-being. The more I decluttered, the more I found comfort in the white space, and in the silence. Are you an introvert, too? Here's some self-care ideas just for you! I'm sure this might have something to do with not feeling like I have to be running around cleaning all the time. I'm actually 100% positive that it does. There were days when I would dread coming home from work because all I could think about was the mess that was waiting for me. Not to mention the crazy long to-do list. How sad is that? No one should ever dread going home. But since I've decluttered and embraced a more minimal lifestyle, my home has become my safe place. It is my escape. And I make sure I leave that safe place as little as possible. I still have chores and things I have to do at home, but I don't have nearly as many. And they also became easier once I got rid of all my stuff. Do you know how easy it is to clean a house that hardly has anything in it?! It's a game changer. So now when I come home, I'm able to have time to just relax. And I'm ok with slowing down and relaxing. I don't feel the need to rush to get things done. I no longer have the need to touch things while I shop. Yup, I was one of those people. One step into a store and I would have the overwhelming need to touch every. single. thing. Sometimes I would reach out and touch the things without even looking at them. It was so obvious I was in sensory overload. Clothes were the worst. I had to feel every item on the rack, even if I wasn't interested in buying it. And I'm also not sure what exactly made me stop. But I've noticed that since I no longer have things high on my priority list, since I've found that things don't make me happy, I have no desire to touch anything when I'm out shopping. If I see something I think I might purchase, that is the only time I'll pick it up. I'm do't know what this means, but for some reason it seems really important. And it's an interesting side effect of my minimalist lifestyle. Embrace your style and learn how to shop like a minimalist! My priorities have changed drastically. When I first started playing around with the idea of minimalism, I was drawn to the idea of spending less time cleaning. Because, well, who wouldn't be? I was so pumped about having more time. But not so I could have more time to relax. No, because that would make too much sense. I wanted more time to do more things. I wanted to cram as much into my day as I could.... just not cleaning. Really, it just doesn't make sense. I wanted to do more things. I wanted to be busier. Because I thought busy meant I was living a productive and full life. Minimalism taught me the opposite. I don't have to do everything. And I don't even want to anymore. I've become very selective about what I spend my time doing. I have fewer hobbies than I used to. I only do the things I really love now. And I have fewer social obligations than I used to (which wasn't many to begin with), because I learned that I need more time alone than I thought I did. My priorities shifted from being busy to spending more time with coffee and cats. I ask "why" more often than I ever have. I've never been one to ask a lot of questions. I hated asking questions. Whatever the situation was, I just accepted how things where and never questioned why they had to be that way. It is what it is, right? I also never questioned why I needed anything. Minimalism taught me to question everything. Every purchase, every gift, every social event. Why? Why do I need this in my life? What value will it add to my life? Is it worth the money I spend on it? Is it worth my financial freedom? How long could I live without it? My minimal lifestyle has caused me to become so much more intentional about every aspect of my life. And that is exactly what it's supposed to do. So why is it surprising? Because I thought I already was being intentional about my life. Looking back, I wasn't at all. This 10 page workbook will guide you along the path to discovering your passions, what you want your decluttered life to look like, and what steps you need to take to get there. Spending less time cleaning has its benefits! When I started slowing down and actually taking time to rest, that's when I realized how deeply exhausted I was. I started paying more attention to the things my body was telling me, and it was telling me to take better care of myself. Because I'm more intentional, I make better choices for myself. I let myself stay home instead of going out with friends if I'm feeling too tired. More fruits and vegetables find their way into my shopping cart at the store. I actually go to bed when I'm tired, instead of saying "I just need to finish this list of things." And the result? I feel so much better. Self-care has become such a huge part of my life because of minimalism. I still have days when I feel tired and exhausted, but I'm more prepared to take care of myself during those times. And I've learned better how to cope with my overwhelming emotions. When we have space in our lives, we can get to know ourselves so much better. We get to know so much better what our needs really are. And that is the first, and most important, step in learning how to take care of ourselves. Learn more about the 5 different types of self-care! I'm more present in my daily life. All of the things listed above have come together and resulted in me being more present in my daily life. Because I have learned to slow down and be intentional, I am so much more mindful of what is going on around me. Now, I sit and drink in my surroundings. And that cup of coffee. I drink that in too, just like always, but now I take my time. I didn't expect any of these things to happen when I adopted minimalism. I thought I'd be in a near-empty house, spending all my free time running around with friends or doing one of the dozens of hobbies I had. Instead, I've found a slow, intentional, and deeply relaxing and fulfilling life. And I wouldn't trade it for anything. If you'e been dreaming of a slow and intentional life, you can start living that life today! Pursuing minimalism changes everything. But change can be scary, so I'm here to help.